WHAT YOU SEE IS ONLY AFTER SOME VERY LONG PERIODS OF POSING BEFORE THEY GET WHAT THEY WANT YOU TO SEE. Sometimes we get pictures of the press photographer directing us into the right pose for what paper wants, after our last “Behind the Scene shots taken at the Indoor Bowls Centre I have been asked to post some more, as some thought that it was just a case of the photographer turns up, looks and snap, takes names and leaves, a total of no more than three minutes. But that is not always the case, Shropshire Star like no more than three people in their photographs, yet the Shrewsbury Chronicle will go more for the group shots, than there is the lighting, people walking past to my glasses turning black as they react to the light. It just goes on, but we started to turn the camera on the photographer, so this series of “Behind the Scene” is really to try and show people that the press photographer does have to work, as well as know their job to get what their editors want and what you as a reader demand. Below are a couple of pictures, one with the photographer getting the Mayoress to understand what he would like her to do to get the right pose for his picture. That same picture was on page 10 of tonights Shropshire Star. Tricia on the left taking instructions from Pete the press photographer before taking the picture that appeared in tonights paper. Here you can just make out Pete in the lower right corner of the picture as he takes the picture for tonights Shropshire Star. Now you will have to get hold of the Shropshire Star to see that I am right. 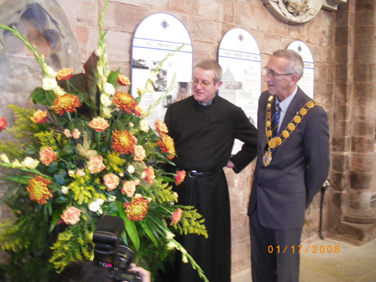 Above the Rev Paul Firmin and myself pose whilst the photographer takes a picture that should be in this weeks Shrewsbury Chronicle. You can just see the photographers camers and top of his head in the bottom centre left of the above photo. Also when these shots are being taken other people can be taking photos around you and their flash off their cameras can and do cause the photographer problems with his exposures in his shots. See I listen and am learning a lot about these official photographers. 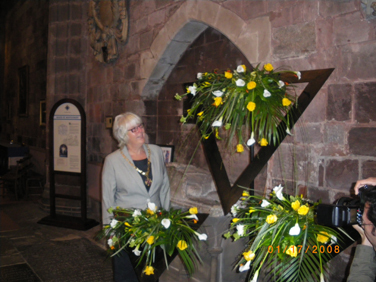 The Mayorality is dependant on a team of people who help make things happen, and press releases, my We’re Proud of Shrewsbury articles in the Shrewsbury Chronicle go through our press officer Suzi Wilkinson. I work closely with Suzi to ensure we have enough positive stories to meet our weekly deadline, yet at the same time ensure that our articles vary from week to week. Below I took my life into my own hands and dared to photograph a press reporter, they are by the very nature of their business a very shy breed of people and do not like to be in front of a camera. So at great risk to my personal safety I took this picture of Suzi hard at work meeting our next dealine. It is at a distance because I am not sure how fast she can run or how good a shot she is at throwing items. Safety First is the Mayors Moto of the day. Still standing as far away as I am able I take my last risk of the day and get a shot of Rebecca Oliver. There are four who work in this office, that is when I am not disturbing them, the desk on the right is where the Mayors secretary sits. I find it a very functional office as it has a kettle, see if you can spot it in one of the above pictures. No prizes sorry. Hope you have enjoyed a light hearted look at one of our series of Behind the Scene. There will be more when I am not sure. 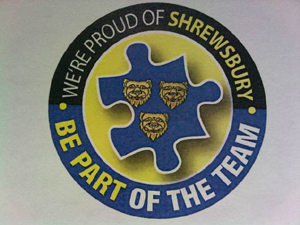 A feature all about good positive stories, a must read if you want to put a smile on your face and be Proud of Shrewsbury, and become Part of the Team. 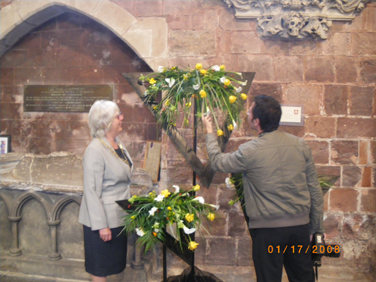 Click on the following link to go to the Shropshire Star Web-site. Thank you. This entry was posted in Abbey, Article, Austria, B: INSPIRED, BBC Radio Shropshire, BE PART OF OUR TEAM, Behind The Scenes, Canadian District 5550, Carpiteria Cal USA, Charity, Column, Fairtrade, Harvest Celebration, Klagenfurt, Klagenfurt Austria, Mayor of Shrewsbury, Mayor of Shrewsbury on-line survey, Mayoral duties, Mayoress, Mayors Parlour, Mayors Secretary, Paul Firmin, Photo Shoot, Portsmouth, Post Office, Pride back into Shropshire, Putting the Pride into Shrewsbury, RABI, Rebecca Oliver, Rev Paul Firmin, Rotary International Exchange, Shrewsbury, Shrewsbury Abbey, Shrewsbury Chronicle, Shrewsbury Living, Shrewsbury Town Car Parking Issues On-Line Survey, Shropshire Star, Suzi Wilkinson, The Abbey Church, Tricia Durnell, twinning, We're Canadian Eh, WE'RE PROUD OF SHRESBURY, Zutphen, zutphen twinning committee and tagged Comments. Bookmark the permalink.